Friday Favorites #75 + We’re Moving! Happy Friday! I’m currently in LA at BlogFest and am loving it so far! I’ll do more of a recap later, but I will tell you that there were some amazing speakers yesterday. I’m really looking forward to the speakers we’ll be hearing from today, including a talk about content marketing by my mentor Amanda Tress, who always provides incredible value. 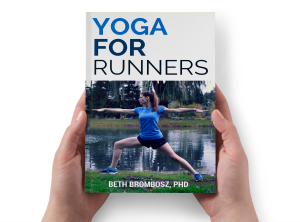 A quick note: Runners, don’t miss the free “Hip Openers for Runners” webinar that I’m giving on Monday, August 1st! Sign up here to reserve your spot! Scott and I are under contract for a beautiful house that we love! Scott is accepting a new job in Oklahoma, which means we’re moving in a few weeks! We’re bummed to be leaving his family and our friends in Chicago, but this is going to be a great opportunity for our family. We already have several friends who work at the same company where Scott will be working, so we aren’t moving somewhere where we don’t know anyone. And, thanks to our good friend Anthony, we’ve even started making some new friends. 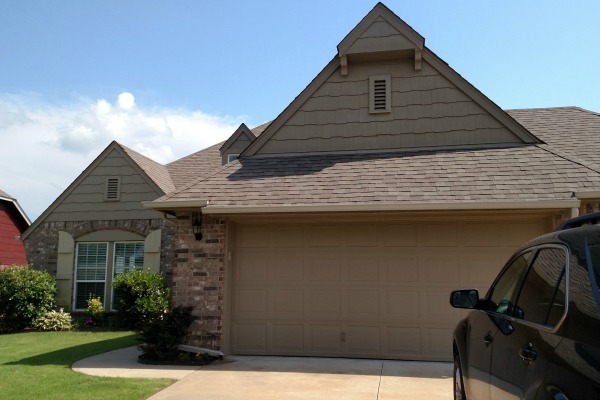 Last weekend, we traveled down to Oklahoma to go house hunting, which was surprisingly exhausting. We spent five and a half hours looking at 15 houses, found one that really stood out from the rest in terms of value, and made a bid. We liked the counter offer we received from the owners, and within 24 hours we were under contract! So, it was a bit of a whirlwind trip, but we got a lot done, and things are moving around nicely. We have a to-do list here, but we’re lucky that Scott’s new employer is paying for a moving company to come pack up our things and move them, so we don’t have to worry about packing. I’m immensely grateful for that. Getting pedicures with my bestie. No photo for this one, but I got to squeeze in a pedicure with my Illinois BFF Olivia on Tuesday. It was nice to just get to relax and really catch up. And, we grabbed a quick bite at a good Mexican restaurant afterwards, which was delish! 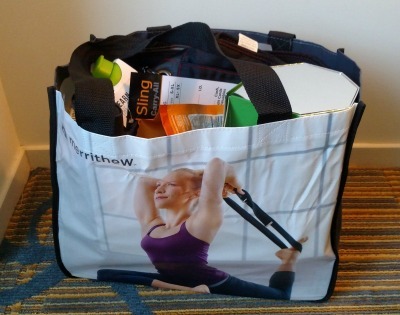 My BlogFest Swag Bag! The BlogFest organizers did a fantastic job of getting sponsors this year, which means we got these giant swag bags! I haven’t completely picked through it yet, but we have goodies from Vega and Vital Proteins, Manitoba Hemp Hearts, a detox kit (think I’ll be waiting until after baby to try that one), a couple of water bottles, and some other goodies, too. I’ll try to include what’s in there in my recap post. Breakfast! 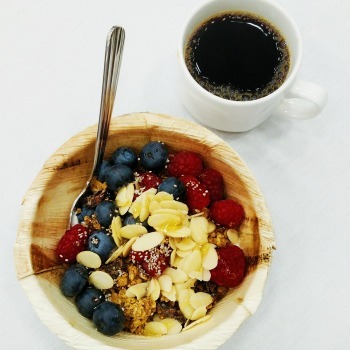 We also had a killer breakfast yesterday sponsored by General Mills. I loaded up on some Greek yogurt with granola, tons of yummy fresh berries, and topped it with a few almonds and a drizzle of honey. It was amazing! 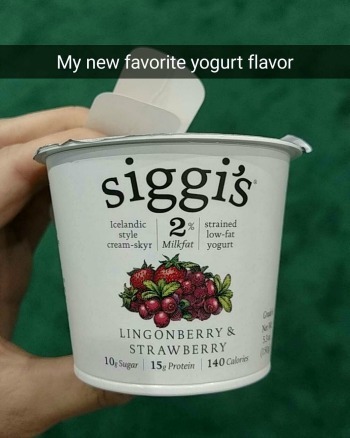 Siggi’s Lingonberry & Strawberry Yogurt. Speaking of yogurt, I am quickly becoming totally obsessed with this lingonberry and strawberry flavored yogurt from Siggi’s. I’m a huge fan of Siggi’s (have a container in my fridge right now, actually…just one because I devoured the rest ;)) and love a lot of their flavors. But, I really love lingonberries, which I loudly profess every time we go to IKEA and I have to eat all of the lingonberry flavored things. So, I was really excited to try this flavor and it is AMAZING! Go buy it if you see it in your grocery store. You won’t be disappointed! That’s about it this week! 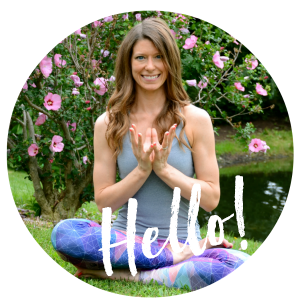 Linking up with lovely Heather for Friday Favorites! Oklahoma has a great running community, so you will fit right in. Siggi’s is an amazing treat! That’s so neat that you’re at Blogfest after getting under contract for a house! What a crazy, amazing life. 🙂 I hope Blog Fest goes so well. Congrats on the new place! Finding a house is HARD work and I’m happy you were able to do it in such a short amount of time!!! What an exciting time for your family! I’m glad it seems like everything regarding your move is going smoothly! I didn’t try that Siggi’s! They’re going to be at Fitbloggin too so hopefully they’ll have more! !